Thank goodness your builder thought of it, yes? What a daily blessing. I'm glad he did, because you get to share the view with us. decided to come here again today. i have gotten lost over at your black and white space. spring is slow in appearing in my cold country but i cling in hope, to green nodes i see popping on the trees. my window, also quite a bizarre one, on the landing looks out over a red roofed barn. it somehow calms me. It's beautiful from both directions. I love little details that make such a huge difference. just beautiful! what a wonderful view. reminds me of having a secret garden. These glimpses of spring...glorious! we are on the fading side of bloom now. everything is blowing in the wind. blessed by my visit tonight, ELK. i love little secret views that surprise us and make us smile. your blog is like that for me. 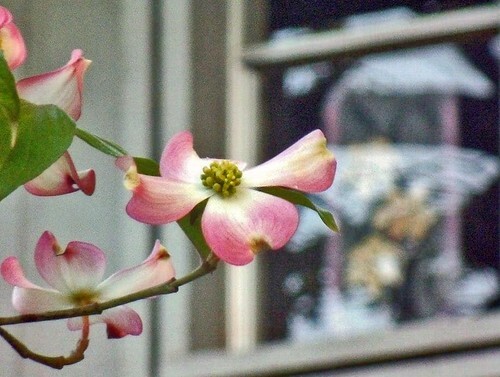 ...love your dogwood view...have loved every single one of your dogwood pics! oh that window was meant for you. thanks for sharing the view. Your view is stunning ELK. The window looks as if it's created to frame nature's art beyond. Lovely images!!! 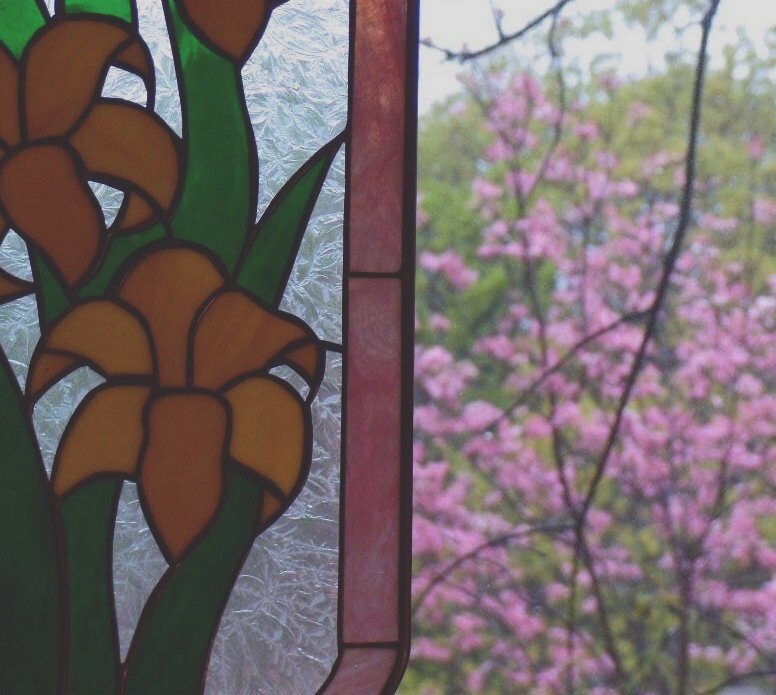 I love stained glass windows! It reminds me of my childhood. And that beautiful tree must be a wonderful sight to see every morning! It's a beautiful view. Maybe the builder had an artist's heart! Nice! I enjoyed your dogwoods from up north! I have a funny little window like that in my stairway - it catches the sunrise like no other window does. Someday I hope to see a dogwood in person! did you change your settings for me?? and now i can tell you how much i love your banner! so minimalist. so gorgeous. i always like from the outside looking in! beautiful images, always!